“Are you confused by what is going on in the Middle-East? Let me explain. We support the Iraqi government in its fight against Islamic State (IS/ISIL/ISIS). We don’t like IS but IS is supported by Saudi Arabia whom we do like. We don’t like President Assad in Syria. We support the fight against him, but not IS, which is also fighting against him. “We don’t like Iran, but the Iranian government supports the Iraqi gov’t against IS. So, some of our friends support our enemies and some of our enemies are our friends, and some of our enemies are fighting our other enemies, whom we don’t want to lose, but we don’t our enemies who are fighting our enemies to win. How people can't see it is beyond me, its so simple, hidden right in front of your face. Man everywhere seem to be caught in the denial of reality. They fear the awful truth and are turning a blind eye… .Therefore, they avoid it and cast it from their minds and consciousness. Just seen it on the headlines page, awsome!! Im gunna print it out and display it form my car window. People always seem to stop and read a notice in a car window i find. He would make far more sense than the bunch of muppets we have controlling the world right now ! Brilliant this. Shows the absolute insanity of it all. Ha ha, Sutch may not be with us any more, but the Loony Party lives on I believe. oh what a tangled web we weave... sounds like a soap opera. I would love to see all of them sitting round the table arguing what to call their new threat. In the end, they all just got confused and went with all three, as and when it came into their heads, and none of them have a clue what term they used the previous day. All the public need to know is that all three of them have made imminent threats; regardless of whether there is any specific intelligence about there being an imminent threat. Oh, and are they an 'Al Qaeda' affiliate or not? To begin with, they were 'worse than, and separate to, 'Al Qaeda''. I saw BBC News today and was reassured that they are definitely an 'Al Qaeda' affiliate though. Maybe 'Al Qaeda' sent in one of their Lieutenants, the 'White Widow' possibly, and recruited them into their movement. Finally, how the hell are we supposed to know who we are arming in Syria? I thought there were supposed to be 'Al Qaeda' units operating against Assad in South Syria, among other radical muslim groups, and this is why we didn't arm them last year. They have already labelled U.S., U.K. and Aussie muslims travelling to Syria to join these groups and fight Assad as 'terrorists', even passing police state legislation in the U.K. to combat the perceived trend, but they now want to arm these groups to the hilt to challenge ISIL. We must all wholeheartedly put our faith in our God fearing leaders and firmly believe that they will get this conundrum right. Nothing to do with getting rid of Assad though. I said something similar a few weeks back. I think it is good for everyone to at least try and make sense of it, then put it into their own words. Who is next then? Last edited by illuminumnuts; 28-09-2014 at 09:14 PM. No I am not...... I CAN CLEARLY SEE THE AGENDA!!! War is a business. Those who profit from war dont care with whom they are at war. God thanks they have war. The more war the better. The American taxpayer pays more than one US billion dollars per day (!!) for that new war versus ISIS. No matter who ISIS is, there is big money for those who get that tax payers money. Since they dont give that money to the Syrian people you can bet where that money will go to: US Weapons industry, US aviation industry, US mercenary services, US security services, Halliburton, etc. Some elites do and did always profit from war. A period of peace is bad for their income and dangerous for their business. If there is no war and no enemy then you'll have to create that enemy. During the past 15 years that elite has learnt about how to create enemies and how to use MSM for advertising that enemy. There's an enemy propaganda and a successful brainwashing system working very well today. That allows them to create enemies whereever they want and as long as they like them to exist. Don't get me wrong: This isnt any government who creates the enemies. It's the war mongering elite who creates them and who needs them for their business. The government is just being lobbied by that elite and the government has to react to the MSM propaganda announced by the elites. Last edited by bluebirdgr; 29-09-2014 at 08:59 AM. It was on John Pilger's FB page 4 days ago. Last edited by i_am; 29-09-2014 at 09:14 AM. They don't have to be clever anymore, people are so dumbed down now they don't seem to have even one inquisitive brain cell in there head. 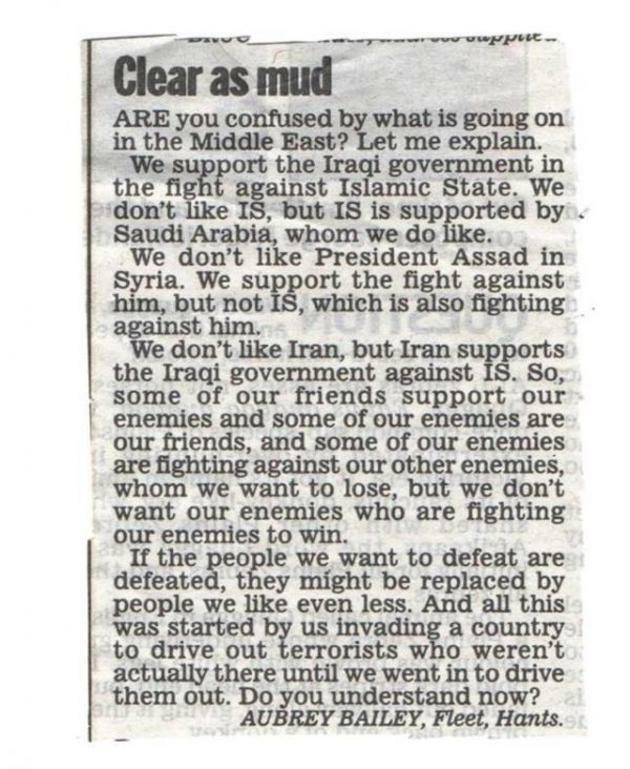 Every poll i have seen, including one in my local newspaper has been in support of bombing ISIS in Iraq and i have no doubt after a few more "they are coming for us" stories, they will also support troops on the ground. The polls are not real and neither are the people who create them "Normal people" they are PR companies hired by Government to push the agenda . just like many of the comments you read in the papers ,all faked for the most part . The same, for the most part, can be said of the writers of "Official" History Books. Saudi Arabia don't support ISIS..
then a collision with America — and, indeed, with its negotiating partners of the Six — is unavoidable. Iran simply cannot be permitted to fulfill a dream of imperial rule in a region of such importance to the rest of the world. Last edited by wandering_sufi; 29-09-2014 at 12:26 PM. If it's permitted would someone go ahead and get the thread started?